We would like to put a volunteer spotlight on one of our youngest volunteers, Anuva Kolli (pictured above). She may be little, but she is doing big things to help in her community. 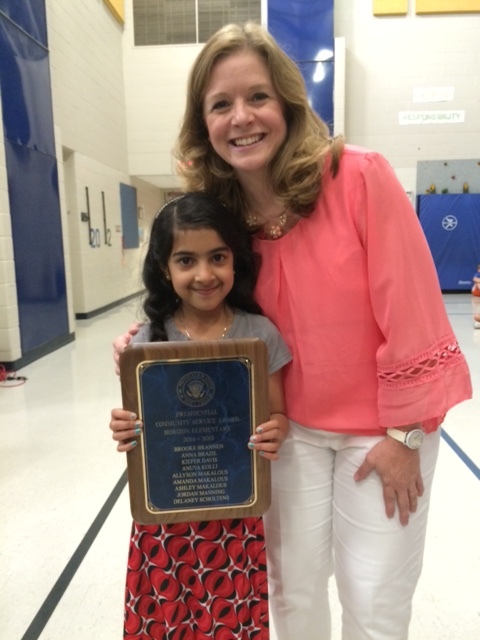 This 9-year-old 3rd grader at Horizon Elementary in Desoto, KS, has been honored with the bronze level Presidential Community Service Award for the past two years, completing a total of over 70 hours of volunteer work. Not too shabby for someone who won’t even be able to drive for seven more years. Anuva and her family have volunteered for Reach Out and Read Kansas City for many years, and this award reflects her service for us and several other agencies. She makes toys for animals at Wayside Waifs, participates in Girl’s on the Run, organized a book drive and continuously labels books to send to Reach Out and Read partner clinics. Anuva says, “ I want everyone to enjoy reading as much as I do. Every day I read about 5 hours”. Anuva enjoys mysteries and funny stories. Right now she is starting the Nancy Drew series.